Engaging Oh My Goddess! Anime and Character Info. In-depth OMG! Chronology Guide for the Dark Horse releases and how they relate to the original Japanese releases. Insightful Info on Oh My Goddess! creator, Kyousuke Fujishima, and the anime Seiyuu. Far-reaching Oh My Goddess! WebRing filled with member sites to visit. Awesome Sneak Peak of the Y.E.S.S. 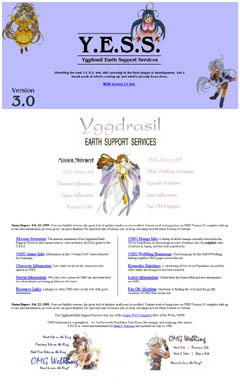 Version 3.0 website. Plus, Web Resources for other Oh My Goddess! fan sites and fan creations and tons of other stuff. "To Provide Earthbound assistance to the Yggdrasil System and its staff." With the stating of the Y.E.S.S. mission statement the site starts with a bang and instantly draws the visitor into the world of the goddesses. A world filled with tons of information, checklists, and fun. The Y.E.S.S. is clearly one of the sites that has to be experienced to fully grasp what webmaster Brian P. Henson has accomplished with the sites that make up The Anime Connection. So, don't forget to check out the excellent Reality Check!-Out Counter and Oh My Goddess! WebRing pages while your visiting.